Members of the Broadcast Film Critics Association (BFCA) bestowed their honors in film during the 20th Annual Critics’ Choice Movie Awards (CCMA). These honors coincided with the revealing of the coveted Academy Awards nominations (January 15)—which can be either a feather in your cap or a hard pill to swallow. In the latter case, three films were vindicated: “Life Itself” won Best Documentary Feature while “The LEGO Movie” won Best Animated Feature and “Force Majeure” won Best Foreign Language Film, all of which are shockingly absent in the Oscar race. At the end of the day—or night, in this case—filmmakers can walk away knowing that their CCMA award was garnered by people (critics) who spend countless hours in dark theaters analyzing film by peeling back the layers, down to the minutest of details that general audiences may have missed. It was a star-studded night, as they say, at the Hollywood Palladium in Los Angeles, complete with iconic tall beam lights that shined up into a clear night sky. Stars arrived on the Red Carpet, posed for photos, gave sound bites to reporters, and were whisked inside to their respective tables all to applaud on cue as the show aired live on A&E, hosted by the energetic Michael Strahan. Strahan opened the show with a bang as tuxedo-clad “Magic Mike” dancers, who at the end of the number were wearing only their spandex shorts, surrounded him. Strahan followed suit, mentioning his up-coming appearance in the sequel to “Magic Mike” while taking off only his trousers followed by a joke about his legs. He displayed a large, charismatic stage presence and comfortably moved amongst the tables in the audience during various points in the show. “Birdman” was the big winner of the night with a whopping seven awards, including Best Actor for Michael Keaton, Best Acting Ensemble, Best Original Screenplay for Alejandro G. Iñárritu, Nicolás Giacobone, Alexander Dinelaris Jr., and Armando Bo, Best Cinematography for Emmanuel Lubezki, Best Editing for Douglas Crise and Stephen Mirrione, Best Actor in a Comedy for Michael Keaton, and Best Score for Antonio Sanchez. 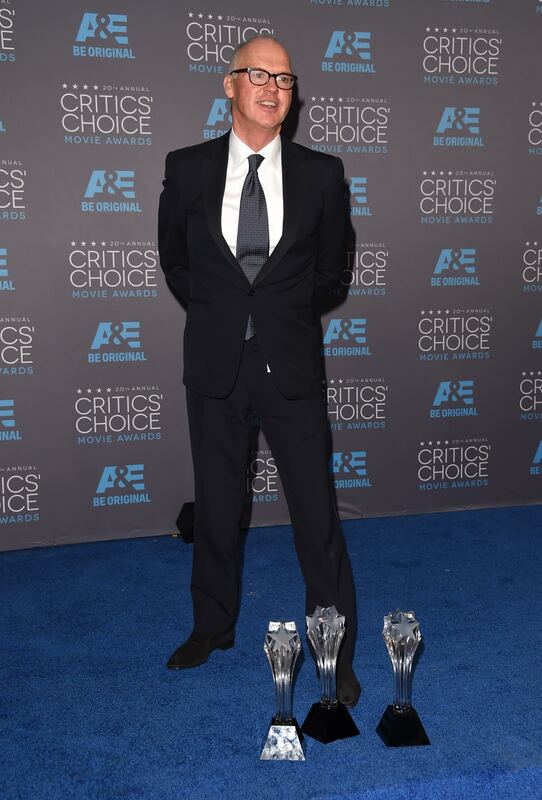 Michael Keaton is the first person in the twenty-year history of the Critics’ Choice Movie Awards to win three awards in a single year (Best Actor, Best Actor in a Comedy, and as part of the “Birdman” Best Ensemble). Yes, he was busy jaunting to and from the stage and, at one point, he tripped on a step and fell approximately four feet off the stage. Ethan Hawke came to his rescue, at which time he regained this balance and seemed to be walking fine. “Boyhood” was named Best Picture and was presented by Sir Ben Kingsley, who, by the way, sat next to me at my assigned table. The film had three additional wins, including Best Supporting Actress for Patricia Arquette, Best Young Actor/Actress for Ellar Coltrane, and Best Director for Richard Linklater. “The Grand Budapest Hotel” claimed three awards, including Best Comedy, Best Art Direction for Adam Stockhausen (Production Designer) and Anna Pinnock (Set Director), and Best Costume Design for Milena Canonero. Julianne Moore, seated a table away, won for Best Actress for “Still Alice.” She looked stunning while walking to the podium, giving a heartfelt speech centering on her role as a woman with Early Onset Alzheimer’s disease. "Thank you very much to the Broadcast Critics for this award. Thank you for noticing a little movie and thank you for honoring me among these really wonderful women. One thing I know about myself for sure is that I'm a girl's girl. I love talking to women, hanging out with women, acting with women. One of the things about being an actress, the hardest part is that you never get to act with other women — or very rarely, anyway. “I'd like to thank all the women who I spoke to who are living with Alzheimer's disease. They are truly, truly amazing. I want to thank them for their time and their generosity, and sharing their experience. I really hope I did you justice. And I want to give a special shout out to my friend Sandy Oltz [50 years of age], my redheaded sister who has been living with Alzheimer's for the last three years. Thank you very, very much for this." J.K. Simmons won for Best Supporting Actor for “Whiplash,” Bradley Cooper for Best Actor in an Action Movie for “American Sniper.” Both were not present. Best Action Movie winner “Guardians of the Galaxy” picked up an additional award for Best Hair & Makeup. Kevin Costner received the “Lifetime Achievement Award,” celebrating more than three decades of outstanding work in film. Rene Russo (“Tincup” costar with Costner) presented the award. As Costner took the stage, he was given a standing ovation. He began his grateful speech stating, “I stand here and can’t help but think there’s been some kind of mistake, like this isn’t for me, like I’m really accepting this for Sean Connery or Gene Hackman because they couldn’t be here themselves. “Life Itself” trio Chaz Ebert (looking very glamorous), Steve James, director, and Garrett Basch, producer, walked the Red Carpet and spoke with us about the film’s message. Highlights of attending the awards show were the interactions between the stars and the critics during the commercial breaks. Table-hopping, chatting, and photo taking were all accepted and the norm. Sitting beside Sir Ben Kingsley was incredible in and of itself. He was charming and toasted with my husband and me after he was poured a glass of champagne. When speaking about his colossal amount of film roles, he told us, “They are like my children, I have no favorites, and who knows what’s to come ahead…that may be my favorite.” No need to do too much table-hopping when you’re sitting with a legend. Jessica Chastain, however, was someone I wanted to meet. She is very beautiful in person; we spoke about her work with Liv Ullmann and the film “Miss Julie.” Chastain had nothing but praise for Ullmann, noting her good fortune to be directed by such a talented woman. Other memorable stars in attendance, in no particular order, were Jennifer Aniston, David Oyelowo, Melissa McCarthy, Angelia Jolie, Emily Blunt, Marion Cotillard, Alexandre Desplat, Ava DuVernay, Jon Favreau, Rosamund Pike, Chris Hemsworth, Eddie Redmayne, Reese Witherspoon, Amy Adams, Oprah Winfrey, Jared Leto, Sir Patrick Stewart, Chris Pratt, Robert Duvall, Cuba Gooding Jr., John Legend, Diane Krueger, and many more. The lavish after-party was held a few blocks away at the Hollywood Athletic Club, which few stars attended, although twelve-year-old Jaeden Lieberher, who stars alongside Bill Murray in "St. Vincent," chatted about how “Bill” always cracked jokes on set every day and that he was constantly laughing, which was not the case with his movie mom, Melissa McCarthy. She was much more serious. As in the film, he’s very comfortable with adults.